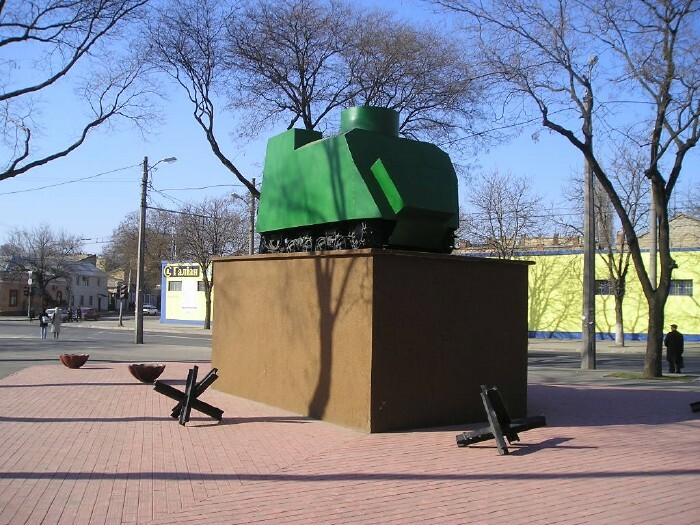 This is a collection of somehow strange Russian tanks. All of them were in production for some time in Russia, USSR or Russian Empire. The one above is 1940 “Self-moving machine gun emplacement point”. 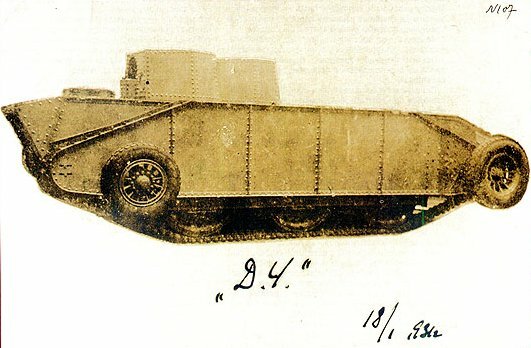 This one is 1930 dual tank – it has both wheels and tracks. This one was made in Latvia when it was part of Russia in 1915. Looks like they were already familiar with eco-design basics. It was a Russian T-60 combined with Antonov plane, tested in 1942 during WW2. A personal tank? Was produced in 1941. It was engineered and produced for usage in World War I, in 1915. It was caled Tsar-Tank. No full-size photo can be found. This was a swimming tank with for tracks, back from 1965. 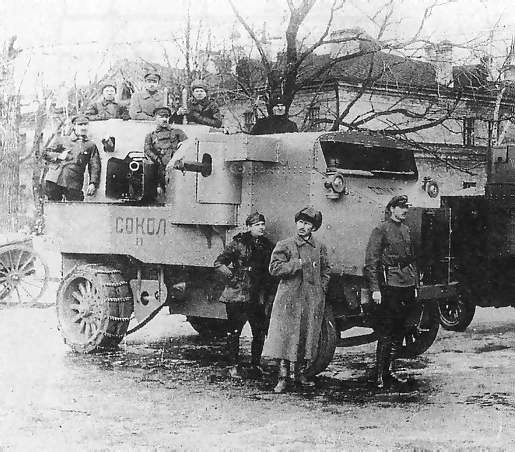 Not really a tank but one of the first very armored trucks, from 1914. Can anyone give me information on the kind of military vehicles use in the russian army now? I am especially interested in the kind of military jeep used. Is it stil the same old UAZ, or is it some new model? Yes but what model do they curentlly use in the Army? Can’t find info anywhere! What ever, believe what you want! I maintain : GET LOST !!! are you crazy? swimming? 1965? 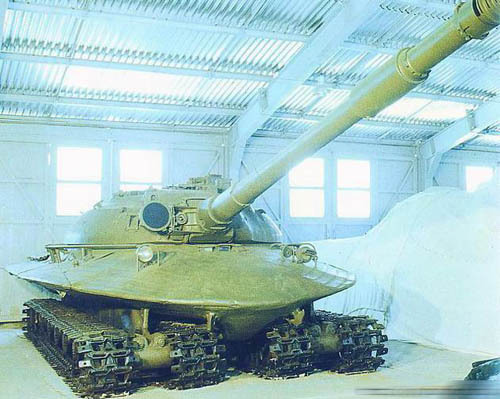 It is a Obyekt 279 – heavy prototype tank. One was built in 1957. 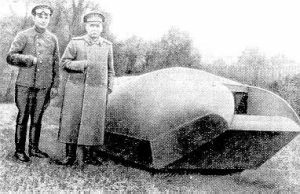 Tsar-tank was never used in combat. It didn’t swimm at all! I noticed in the 4th and last photo that the soldiers found it very fashionable to pose like the famous Napolean portrait, with their hand inside of their coat. Rather odd for a nation that had to fight Napolean off of their land a few generations before. Photo #8 is obviously a converted bulldozer. I have heard of those, but not seen a photo of one. A decade later (than the photo time) Josif Dzugshvili (Stalin) used to exhibit such ‘Napoleon pose’. In fact, Stalin used such pose cause he had one arm shorter and didn’t want to stay in natural pose. 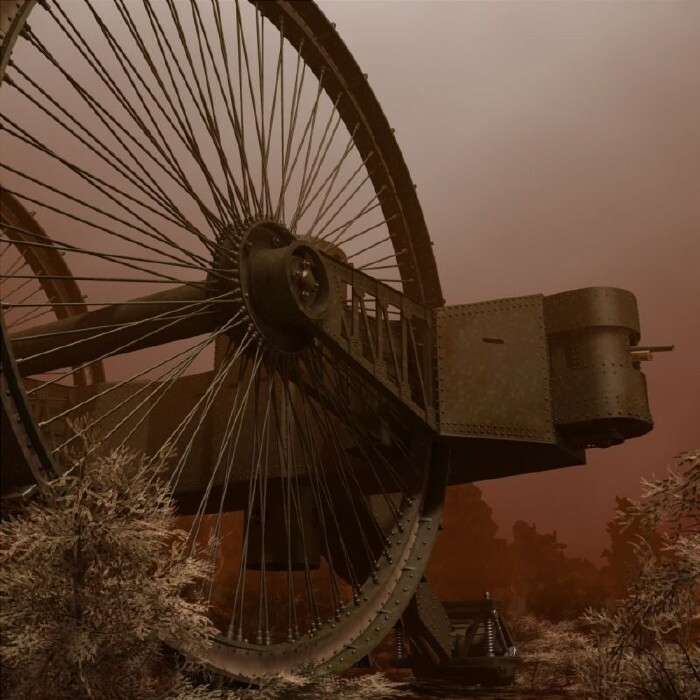 The multiple turret machine would have been impressive moving in a straight line across the battlefield, then watching it try to get round obstacles would make the enemy die from laughter. Effective in both cases. The KV-6 is a trip. The first one broke in half the next ones real turret fired into the middle turret and the last one flipped over when all the guns fired at the 3oclock position. 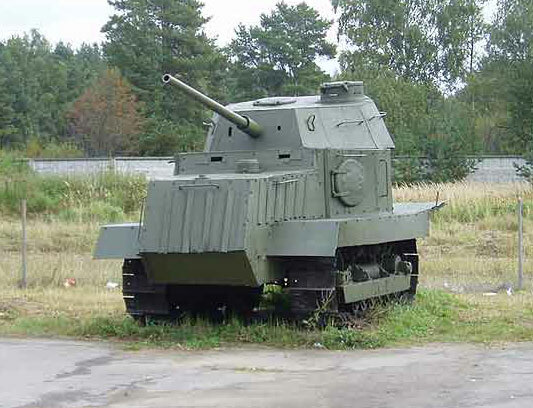 You should also have a pic of the BA-64..Just look at my forum thread on BA-64 and Crazy Russian tanks. The KV-VI is the 13th one down. Although succesfully flown in 1942, test pilot S.N. 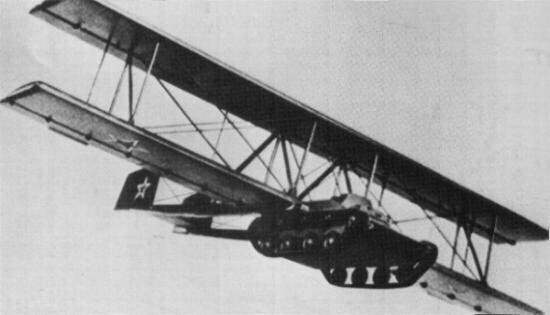 Anokhin found the Antonov A-40 or KT flying tank required considerable skill to land. One of the first of the famous Antonov heavy lifters. That multiturreted beast won’t have a full-size photo, because it’s a custom-built model. Not sure of the source – thought it might be from the Gear Krieg miniatures wargame, but a quick look through my books shows a different one. The largest self propelled gun, in this case a 600mm mortar, which saw action was build just before the second world war bij the German factory Rheinmetall. It was mostly named Karl. 7 of them are build for use against the French Maginot line. But they arrived to late, or, Hitlers blitz krieg was to fast so they be used at the east front. The names are: Thor, Odin, Adam, Eva, Loki and Ziu. Karl, the 7th remain at the test sight in Germany. 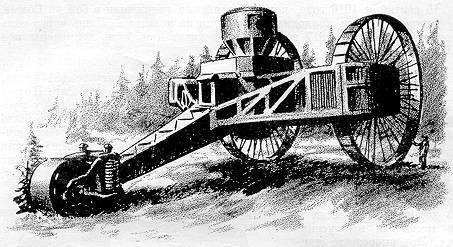 The mortar weight 124 metric tons and can move itself at short distances with a speed of 10 km/h. 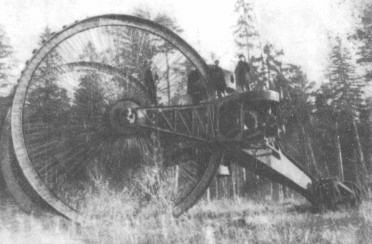 For longer distances over roads, the gun was seperated in differend smaller pieces and transported with special build trucks. For verry long distances, the gun was transported as one piece hanging between two special designed railroad carriers. The granates weight just over 2 metric tons and are made of concrete. The average distance was 4,5 km and the shell was capable of penetratie 2,5 metres thick reinforced concrete. With a good crew, it can fire 6 shots per hour. An modified Panzer-4 tank was used to load the gun with his space for 4 granates and a 2,5 ton crane. Later in the war, the gun was adapted with a longer barrel of 540mm calibre which give the gun a way better performance. Now it was firing over distances of 10 km, has a way faster muzzle velocety and can now penetrate 3,5 to 4 meter thick reinforced concrete. 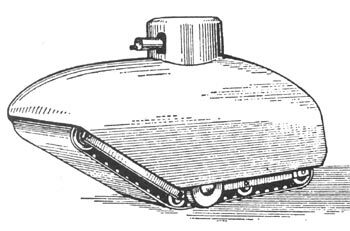 The tank with the 2 sets of treads (4 caterpillars) was not a swimming tank. It was meant to be a tank capable of surving on a nuclear battlefield. 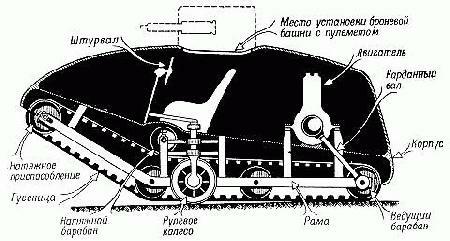 The reason for the double tracks was weight and traction which gave it the ability to go in terrain usually unsuitable for other tanks. It has been called the “swamp tank” also. The second last tank is an atomic tank. Built to survive nuclear blast. 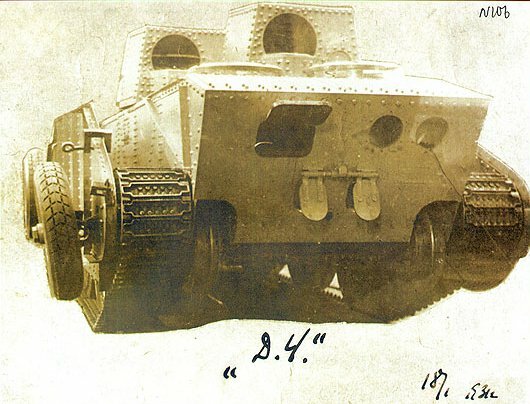 The multi-turreted beast was never a real tank. It is a custom model made by an English hobbyist. It was originally on the Internet in the late 1990’s, accompanied by a fictional history of its development & use in battle. It was a prank. I know, because I corresponded with its maker.